How leukemia affects on body? How does leukemia affects on body? Before going on to explain the symptoms of leukemia, a brief explanation of the role of healthy leukocytes and leukocytes in this disease is needed. The production of leukocytes is made in the bone marrow. In healthy individuals, these cells are produced in an orderly and controlled manner, according to the needs of the immune system. In leukemia, a cell mutates, becoming different from other leukocytes and multiplying in a disordered and uncontrollable way. Leukocytes are the defense cells responsible for fighting invading germs. Whenever there is an infection, mainly of bacterial origin, the bone marrow increases its production so that the body has greater capacity to defend itself. Our blood has on average between 4,000 and 11,000 leukocytes in every milliliter. When there is an infection, this number can exceed 20,000 cells per milliliter. This leukocyte elevation is called leukocytosis and is a natural response of the body to infections. Leukemia is a cancer that arises in the bone marrow, causing uncontrolled production of leukocytes. 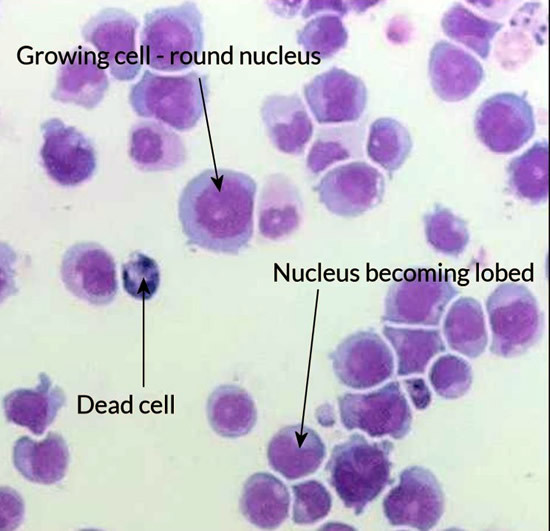 Unlike leukocytosis arising in infections, leukemia leukemia is an abnormal and harmful event. Leukemia leukocytes are atypical, incapable of fighting infectious agents. If leukocytes are common in infections, they are around 20,000-30,000 cells/ml; in leukemias this number easily surpasses 60,000 cells/ml, reaching more than 100,000 cells/ml. The leukocyte that undergoes the malignant transformation, that is, turns to cancer, begins to multiply of uncontrolled form, occupying all the bone marrow, being able to extravasar to the blood and other organs. There are acute leukemias, which are those that present greater multiplication and aggressiveness; and chronic leukemia, which present a more drawn evolution, and may take years until the first symptoms appear. Let's talk a little bit about the most common symptoms of all of them. Fever in leukemia can be caused by an opportunistic infection that takes advantage of the fact that leukocytes are sick and unable to defend the body. The leukemia patient is more susceptible to infections. However, the most common is fever originating in leukemia itself. The leukemia fever usually lasts for several days and is of obscure origin, that is, you can not find a cause for it. This fever can be high and come accompanied by chills. Some patients with malignant blood diseases, such as lymphomas and leukemias, may present the so-called B-symptoms, which is a triad composed of fever, night sweats and unintentional weight loss. The appearance of painless lymph nodes, especially in the neck, armpit, clavicle, and elbow fossa regions is a common symptom of leukemia, especially acute lymphocytic leukemia (ALL) and chronic lymphocytic leukemia (CLL), where more than 50% of patients present this change. In acute myeloid leukemia (AML), enlargement of the lymph nodes is uncommon. The spleen is a species of giant lymph node, whose main function is to destroy old, defective and malfunctioning blood cells. Enlargement of the spleen is very common in CML, ALL and CLL forms, and may cause pain in the upper left quadrant of the abdomen. As the proliferation of cancer cells is gigantic, they end up occupying the entire bone marrow, disrupting the production of other important blood cells, such as red blood cells. Reduced production of red blood cells leads to anemia, which in turn causes symptoms such as tiredness, asthenia, intolerance to exertion and skin pallor. Just as the marrow occupation by the leukemic cells causes a decrease in the production of red blood cells, the same happens with platelets, another type of blood cell produced in the bone marrow. Because platelets are the cells responsible for the initial process of blood clotting, it is common for patients with low platelets to have bleeding, especially on the gingiva, and bruises (purple patches on the skin). Petechiae, which are multiple small red spots on the skin, may also occur. As the bone marrow gets inside the bones, the expansion of malignant clones of leukocytes inside it can cause bone pain. Another cause of bone pain is metastasis from cancer to bone, which causes bone destruction. Most of the symptoms described above occur in the acute forms of leukemia. Generally, chronic leukemias are identified in the laboratory by finding a leukocytosis that is disproportionate to clinical status. Many patients discover chronic leukemia before they have clinical manifestations of the disease.